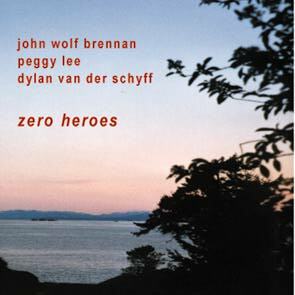 "Zero Heroes" documents a "blind date" between the stalwarts of the Vancouver new music scene Peggy Lee (cello) and Dylan van der Schyft (drums) and the Irish born Swiss resident John Wolf Brennan (piano). However, this encounter is not some reckless piece of bravado. The three musicians manage to create a work of chilling beauty. As Greg Buium writes in his liner notes: "In the end, "Zero Heroes" is an impeccably crafted suite, pulled out of the air by three improvisers with nearly unlimited technical and emotional resources." Total duration: 58'16.